Map of the Shawnee Trail. Image available on the Internet and included in accordance with Title 17 U.S.C. Section 107. SHAWNEE TRAIL. Of the principal routes by which Texas longhorn cattle were taken afoot to railheads to the north, the earliest and easternmost was the Shawnee Trail. Used before and just after the Civil War, the Shawnee Trail gathered cattle from east and west of its main stem, which passed through Austin, Waco, and Dallas. It crossed the Red River at Rock Bluff, near Preston, and led north along the eastern edge of what became Oklahoma, a route later followed closely by the Missouri-Kansas-Texas Railroad. The drovers took over a trail long used by Indians in hunting and raiding and by southbound settlers from the Midwest; the latter called it the Texas Road. North of Fort Gibson the cattle route split into terminal branches that ended in such Missouri points as St. Louis, Sedalia, Independence, Westport, and Kansas City, and in Baxter Springs and other towns in eastern Kansas. Early drovers referred to their route as the cattle trail, the Sedalia Trail, the Kansas Trail, or simply the trail. Why some began calling it the Shawnee Trail is uncertain, but the name may have been suggested by a Shawnee village on the Texas side of the Red River just below the trail crossing or by the Shawnee Hills, which the route skirted on the eastern side before crossing the Canadian River. Shawnee Trail Commemorative Sculpture at Pioneer Plaza in Dallas. Courtesy of Johnny D. Boggs. Image available on the Internet and included in accordance with Title 17 U.S.C. Section 107. Shawnee Trail Sculpture in Frisco. Image available on the Internet and included in accordance with Title 17 U.S.C. Section 107. 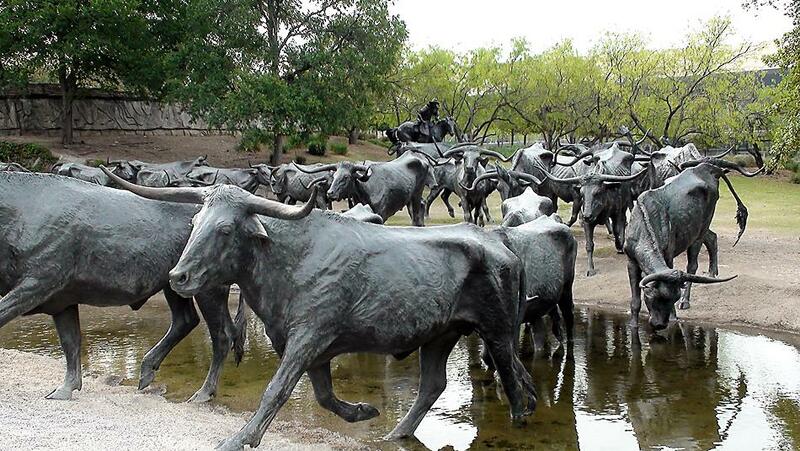 Texas herds were taken up the Shawnee Trail as early as the 1840s, and use of the route gradually increased. But by 1853 trouble had begun to plague some of the drovers. In June of that year, as 3,000 cattle were trailed through western Missouri, local farmers blocked their passage and forced the drovers to turn back. This opposition arose from the fact that the longhorns carried ticks that bore a serious disease that the farmers called Texas fever. The Texas cattle were immune to this disease; but the ticks that they left on their bedgrounds infected the local cattle, causing many to die and making others unfit for marketing. Some herds avoided the blockades, and the antagonism became stronger and more effective. In 1855 angry farmers in western and central Missouri formed vigilance committees, stopped some of the herds, and killed any Texas cattle that entered their counties. Missouri stockmen in several county seats called on their legislature for action. The outcome was a law, effective in December of that year, which banned diseased cattle from being brought into or through the state. This law failed of its purpose since the longhorns were not themselves diseased. But farmers formed armed bands that turned back some herds, though others managed to get through. Several drovers took their herds up through the eastern edge of Kansas; but there, too, they met opposition from farmers, who induced their territorial legislature to pass a protective law in 1859. Shawnee Trail Impact on Transportation. Courtesy of Johnny D. Boggs. Image available on the Internet and included in accordance with Title 17 U.S.C. Section 107. During the Civil War the Shawnee Trail was virtually unused. After the war, with Texas overflowing with surplus cattle for which there were almost no local markets, pressure for trailing became stronger than ever. In the spring of 1866 an estimated 200,000 to 260,000 longhorns were pointed north. Although some herds were forced to turn back, others managed to get through, while still others were delayed or diverted around the hostile farm settlements. James M. Daugherty, a Texas youth of sixteen, was one who felt the sting of the vigilantes. Trailing north his herd of 500 steers, he was attacked in southeastern Kansas by a band of Jayhawkers dressed as hunters. The mobsters stampeded the herd and killed one of the trail hands; (some sources say they tied Daugherty to a tree with his own picket rope, then whipped him with hickory switches.) After being freed and burying the dead cowboy, Daugherty recovered about 350 of the cattle. He continued at night in a roundabout way and sold his steers in Fort Scott at a profit. With six states enacting laws in the first half of 1867 against trailing, Texas cattlemen realized the need for a new trail that would skirt the farm settlements and thus avoid the trouble over tick fever. In 1867 a young Illinois livestock dealer, Joseph G. McCoy, built market facilities at Abilene, Kansas, at the terminus of Chisholm Trail. 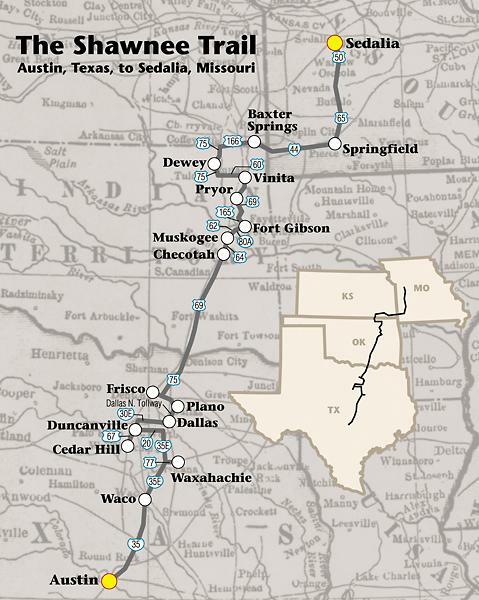 The new route to the west of the Shawnee soon began carrying the bulk of the Texas herds, but the Shawnee Trail continued to supply cattle to processing plants and the path was mirrored by the Missouri-Kansas-Texas Railroad. Wayne Gard, "The Shawnee Trail," Southwestern Historical Quarterly 56 (January 1953). Joseph G. McCoy, Historic Sketches of the Cattle Trade of the West and Southwest (Kansas City, Missouri: Ramsey, Millett, and Hudson, 1874; rpt., Philadelphia: Porcupine, 1974). Handbook of Texas Online, Wayne Gard, "SHAWNEE TRAIL," accessed April 22, 2019, http://www.tshaonline.org/handbook/online/articles/ays02.